The South Carolina Department of Transportation (SCDOT) has scheduled a public hearing Tuesday, July 17, in Edgefield County concerning the proposed improvements to US 25 from Secondary Road 429 (Barton Road) to SC 19 (Augusta Road). The hearing will be between 4:30 p.m. and 6:30 p.m. in the Mt. Canaan Baptist Church Fellowship Hall located at 2451 Edgefield Road (US 25) in Trenton. The purpose of the hearing is to provide an opportunity to review and discuss individually, with representatives from SCDOT, the proposed improvements to US 25 from Secondary Road 429 (Barton Road) to SC 19 (Augusta Road). The proposed improvements consist of widening the existing US 25 from two lanes to four lanes. In addition, an opportunity will be provided for comments on the project’s impacts to Edgefield County. Another purpose of the hearing will be to gather information from the public or any interested organization on historic or cultural resources in the area. From 4:30 p.m. until 5:30 p.m., the meeting format will be informal. Aerial displays of the project will be available for viewing, and project team members from SCDOT will be present to discuss the project with interested citizens, on an individual basis. At 5:30 p.m., SCDOT will make a brief, formal presentation in the auditorium about the project purpose and need, schedule, and potential natural and human impacts to the community. Immediately following the presentation, citizens will have the option to make formal, verbal comments regarding the proposed project. 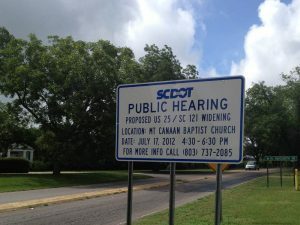 Anyone who wishes to verbally comment must sign up between 4:30 p.m. and 5:25 p.m. when entering the public hearing. Each comment will be limited to two minutes and may not be transferred. The informal portion of the public hearing will continue during this time. Project details, including draft environmental documentation of the project’s effects, will be provided. Maps and drawings of the proposed improvements will be available, and citizens may ask questions and provide comments regarding the possible social, economic and environmental effects of the project. Property owners and business owners on or near the project area are urged to attend. Related maps and/or drawings, will be available for public review at least 7 days prior to the information meeting, at the SCDOT District Two Office located at 510 West Alexander St., Greenwood, SC, and the Edgefield County Maintenance Office located at 851 Highway 25 North, Edgefield, SC 29824. Additional information concerning the project may be obtained by contacting Project Manager Clint Scoville at (803) 737-2085, in Columbia. Persons with disabilities who may require special accommodations should contact Elisabeth Bleasdale at (803) 737-1395.